ahead of the 2018 World Series at Fenway Park on October 22, 2018 in Boston, Massachusetts. The Red Sox have agreed to a contract extension with manager Alex Cora after a fantastic start to his tenure with the team. Cora's contract, which was set to expire in 2020, was extended through 2021 with a team option for the 2022 season, the Red Sox said. The Red Sox hired Cora, then a bench coach, away from the Houston Astros in October of 2017, after the Astros beat the New York Yankees in the ALCS and before they beat the Los Angeles Dodgers in the World Series. 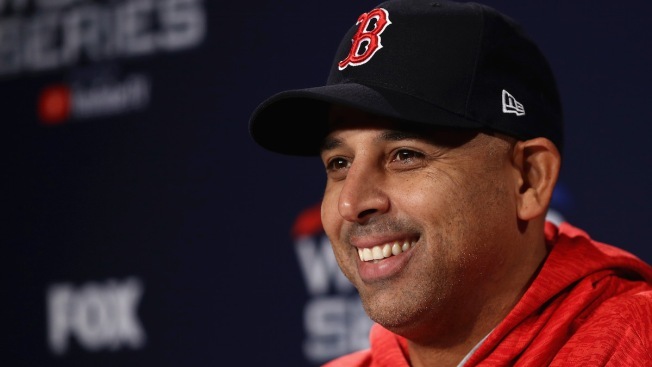 In his first year as manager, Cora led Boston past the Yankees, Astros and Dodgers to win the 2018 World Series. The 108-54 record Cora's Red Sox achieved in the regular season is the best in team history. Only Ralph Houk, skipper of the 1961 Yankees, had a better record as a rookie manager. Houk's team won 109 games. "Alex did a tremendous job for our club all year long and we wanted to reward him for his efforts after an amazing season," President of Baseball Operations Dave Dombrowski said in a statement. "We are extremely happy that he will be with us and leading our club on the field." "Since day one, John and Linda Henry, Tom Werner, Mike Gordon, Sam Kennedy, and Dave Dombrowski have been incredibly supportive of me and my family, and for that I am extremely grateful," Cora said in a statement. "For me, 2018 was not only historic, but it was special as well, both on and off the field. We have a great appreciation for our accomplishments this past year, but now our focus moves forward to the season ahead and defending our World Series title." The ring was Cora's first as a manager, but he won one as an infielder on the 2017 Red Sox, as well.